Roadside site of former RAF Witchford. Located outside on private land. 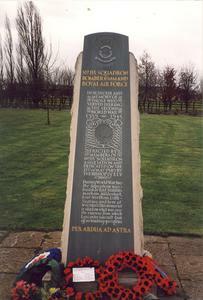 Rough hewn obelisk with slate inscription tablet fixed to front. Title and motto in gilt. Plain metal panel on reverse gives squadron history. Squadron crest above the inscription.